The report is co–authored by researchers from the Centers for Disease Control and Prevention, the North American Association of Central Cancer Registries, the National Cancer Institute, and the American Cancer Society. It appears early online in the journal CANCER, and will appear in print in the May issue. 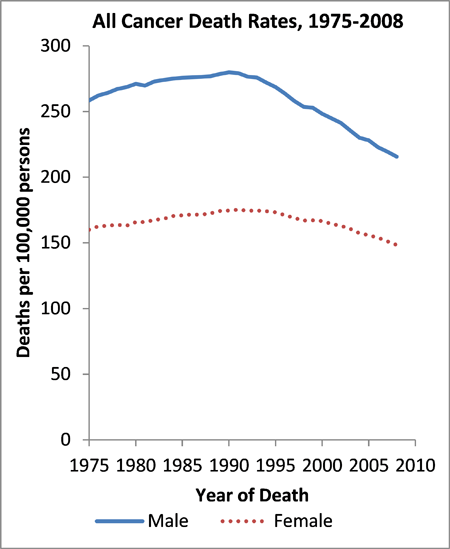 Among children aged 19 years or younger, cancer incidence rates increased 0.6 percent per year from 2004 through 2008, continuing trends from 1992, while death rates decreased 1.3 percent per year during the same period. These patterns mirror longer–term trends. Reference: Eheman C, Henley SJ, Ballard–Barbash R, Jacobs EJ, Schymura MJ, Noone AM, Pan L, Anderson, RN, Fulton JE, Kohler BA, Jemal A, Ward E, Plescia M, Ries LAG, Edwards BK. Annual Report to the Nation on the Status of Cancer, 1975–2008, Featuring Cancers Associated with Excess Weight and Lack of Sufficient Physical Activity. CANCER; Published Early Online: March 28, 2012 [DOI: 10.1002/cncr.27514]. CDC works 24/7 saving lives, protecting people from health threats, and saving money through prevention. Whether these threats are global or domestic, chronic or acute, curable or preventable, natural disaster or deliberate attack, CDC is the nation′s health protection agency. The National Cancer Institute (NCI) leads the National Cancer Program and the NIH′s efforts to dramatically reduce the burden of cancer and improve the lives of cancer patients and their families, through research into prevention and cancer biology, the development of new interventions, and the training and mentoring of new researchers. For more information about cancer, please visit the NCI Web site at http://www.cancer.gov or call NCI's Cancer Information Service at 1–800–4–CANCER (1–800–422–6237). 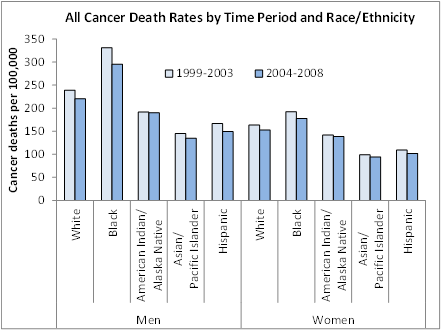 The North American Association of Central Cancer Registries, Inc. (NAACCR, Inc.), is a professional organization that develops and promotes uniform data standards for cancer registration; provides education and training; certifies population–based registries; aggregates and publishes data from central cancer registries; and promotes the use of cancer surveillance data and systems for cancer control and epidemiologic research, public health programs, and patient care to reduce the burden of cancer in North America.